THE FARAHAN RUG - Persian rugs and culture mixed for perfect patterns. Farahan is the name of a small village in central Iran, located north of the modern city of Arak. Internationally, it is known for what are widely considered to be some of the greatest rugs made during the 19th century. The Farahan rug was, from the beginning, created especially for export to the high-end American Market. In the 19th century, the prized carpets of Persia were in high demand (particularly in the burgeoning field of interior design), and competition for export to western markets was fierce. For this reason, sparing no cost or labor, the Farahan rugs were conceived of as classically-derived, exquisitely-detailed centerpieces for sale in international markets. 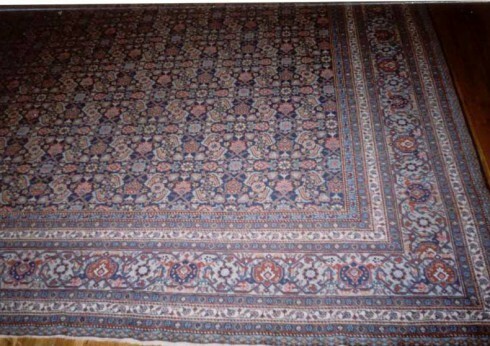 In scale, almost all antique Farahans are room-sized. Their creation required tremendous time and labor, and though they are often attributed to the workshops of Farahn Village itself, weavers historically worked in neighboring villages such as Mushkabad and Malayer as well. Interestingly, while the Farahan region has a long cultural history—the area of central Iran was one of the ancient settlements on the Iranian plateau--its history of carpet-weaving dates only to the 19th century, when a new economic era created new opportunities for local craftsmen. Thus demand from international markets (particularly America) spurred the creation not only of the region’s finest Farahan rugs, but also of the region’s rug-making industry as a whole. The Farahan carpet is in fact a part of this broader rug category, the Sarouk, which became one of the most significant carpets on the international market through the mid-20th century. In Farahan, weavers took advantage of the high quality wools and natural dyes native to the area, and for design drew on traditional Persian patterns to create an entirely singular 19th century rug. The Farahan rugs were a success, and Sarouk quickly became one of the most active centers of carpet weaving in the late 19th and early 20th centuries. Today, Farahan rugs are famous in part for a subtlety and detail of color that has proven to be irreproducible. And for good reason. The natural-dyed colors of antique Farahan rugs have a fascinating history all their own. All rugs made for export in the Arak region of Iran during the late 19th and early 20th centuries underwent a standard alkaline finishing process. This process, when applied to delicate Farahan dyes, resulted in colors perceived by dealers to be insufficiently bold for an American market then fixated on the rich blues and bold reds of other Persian and Turkish carpets. In particular, the red of the Farahan rugs, a natural rose-colored dye, was prone to significant fading in the alkaline bath. 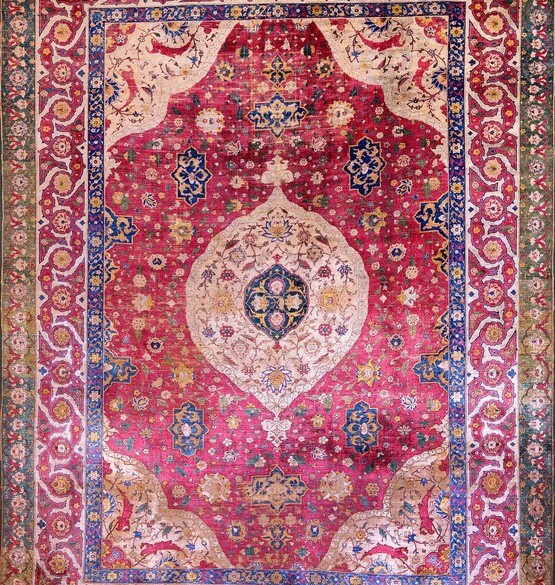 The solution to the issue was unique in the history of rug-making, and perhaps the most significant factor in creating the singular quality of Farahan color: using synthetic bright raspberry dyes applied to small paint-brushes, entire staffs were employed by New York rug dealers to painstakingly dye the rugs by hand. Besides their color, the rugs are valued for their intricate geometric patterns, most frequently their many variations on the traditional Herati pattern, a design in which central flowers branch outward in an infinity of curving leaves. The weavers of Farahan carpets employed the Herati motif (also known as the fish motif for the inner leaves’ resemblance to fish) in an astounding variety of ways--different shapes and sizes and detail unfold with endless variation. Somewhat less commonly, though still with striking attention to detail, other Farahan carpets are designed around the central medallion motif, a classical Persian form. 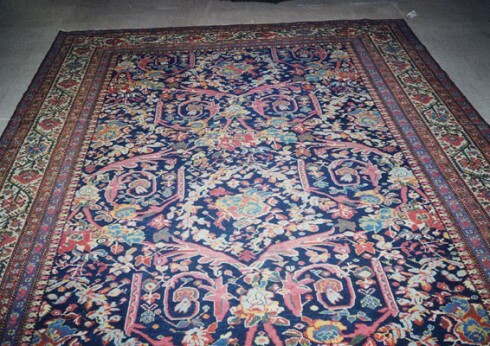 Today, Farahan rugs are some of the most highly valued in the world. Reserved, elegant, and supremely detailed, the room-sized carpets, each made with an extremely fine weave (typically made by asymmetrical wool knots on a cotton background), are the singular creations of turn-of-the-century Iran.